Jim tells Helen that Douglas has done a runner with their money. Helen goes to the cottage she was supposed to be buying and finds it occupied by someone else. Lucy finds the gun Daphne is keeping for her friend in the flour bin. Terry steals the gun and puts it in her handbag. Terry goes round to Charles's place and points the gun at him. Sarah has got Jim and Lucy blowing up balloons for the party and generally is getting on everyone's nerves. Daphne tells her off and Sarah stomps off! Daphne and Lucy start cooking and Daphne realises that the gun has gone from the flour bin. She quickly runs out, much to Sarah's displeasure. Max and Danny are hanging out waiting until it's time to go to the party at Des's. Danny doesn't want to go to early in case Sarah puts him to work(!) Max and Danny chat amiably about work and the girls there. Sarah answers the phone and it's Paul - he's looking for Terry because she hasn't come home yet. Just then, Harry arrives and Sarah immediately starts giving him work to do. He's not having any of it, though, and goes off to see Des! Charles is lying prone on the floor. Daphne knocks on the door and then enters. She's shocked to see Charles lying there and feels for a pulse. Barbara sees this through a grille in the door. When Daphne stands up, there is blood on her skirt. She quickly leaves the apartment, shutting the door behind her. Barbara comes out from behind the door and starts to sob over Charles. Then she goes to the telephone. BARBARA: Hello? I wish to report a murder. A Mr Charles Durham. No, I didn't kill him. It was a woman called Daphne Lawrence! Paul is on the phone trying to track Terry down, but just then Terry arrives home. He asks her where she's been and she irritably tells him she had to go to a few shops. Paul suggests forgetting the party and having an early night. PAUL: Come on, nothing's ever going to come between us. TERRY: Nothing ever will anymore. TERRY: As soon as we're overseas, we can start another life for ourselves. Paul says at least the baby will be growing up in a safe environment. TERRY: I've never loved anyone as much as you. They head off to the party. Helen is reading on the sofa and Lucy is pleased to see her out of her room. Lucy says that she doesn't like Sarah very much - she's nearly as bossy as Mrs Clarke and she's a hopeless organiser. Lucy says that Daphne, Paul and Terry aren't there to help organise things - they need Helen to help organise things. Helen says that she's not dressed for a party, but eventually agrees to "put on a face"
Des, Jim and Harry are sitting at the table having a beer and not doing any work(!) Helen and Lucy arrive. SARAH: Mrs.Daniels, thank goodness you're here. No-one will do anything I ask. Helen starts to organise everyone and they cheerfully go off to do the jobs she sets them(!) Jim hugs her - glad to see her coming out of her emotional turmoil. Just then, Terry and Paul arrive. Harry asks them for a donation to the charity of the evening. Suddenly, someone drops something and the crash sounds a bit like a gunshot, making Terry jump. TERRY: What do you think you're doing? That isn't very funny. 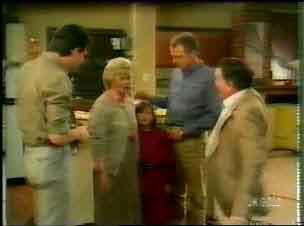 Paul is surprised at Terry's edginess, but he quickly forgets it and goes to see Des in the kitchen. Des can't think where Daphne has got to. A few minutes later, Daphne comes in through the back door. She sees Terry and they exchange A Look. Terry can see that Daphne knows what she has done. DES: Where have you been? DAPHNE: Des, I have to talk to you. DAPHNE: Not here, it's urgent. DES: Why, what is it? There is another knock on the door, and this time it's the police. POLICEMAN: I'm Inspector Jarvis. We're from the homicide squad. LUCY: Daphne! There's blood on your dress! For some reason, the police are interviewing everyone individually at Des's dinner table. First, they talk to Paul. He asks him about Terry's involvement with Charles. 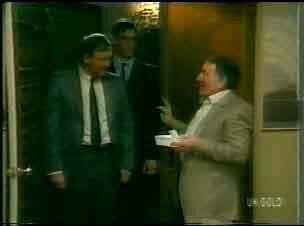 Paul tells them that he met Charles Durham once - to tell him to stop making threatening phonecalls to his wife. They ask where Paul was at around 5pm. Paul said he had just got back from Jim's, but that Terry went to the shop to get some things for the party - she got back around 7pm. The police call Terry to the table. Paul has come home, but it's clear his mind is working overtime - he's putting all the pieces together. He flashes back to Terry saying that "no-one would come between them anymore". He goes to sit on the sofa, moving Terry's bag out of the way, and the gun falls out of the bag. Paul picks it up and looks anguished. He flashes back to Terry jumping so hard at the innocent crash at Des's earlier. He realises what Terry has done. The police are asking Terry why she didn't contact the police about Charles. She says she didn't think the police would be interested in a jealous boyfriend, and anyway, it was all over between her and Charles ages ago. Terry has apparently decided to frame Daphne, because she tells them to ask Daphne their questions instead, after all, Daphne was having dinner with Charles the other night. Daphne overhears this and look outraged. Terry goes on that she suspects Daphne told Charles where to find her, and goes on that Charles was going to leave the country without Daphne with an anonymous woman. Daphne must have been giving Charles a hard time because he tried to kill her the other day by running her over. DES:(to Daphne) I don't know what Terry's going on about, but I do know one thing - you didn't kill that creep. The police release Terry from her questioning, and tell Daphne that she'll have to come down to the police station to "help with their enquiries". Paul is sitting quietly on the sofa when Terry comes in. He tells her that he can't believe that Daphne would shoot anyone. TERRY: Charles must have suspected something, that's why he was leaving the country. TERRY: Daphne told me tonight. Paul says he didn't think Terry and Daphne had had a chance to talk before the police arrived. TERRY: At least Charles is out of our lives now. PAUL: Yeah. We should be grateful to Daphne, shouldn't we. There is a bit of a silence and Terry says she's going to bed. But Paul calls her back. He wants to talk further. Sarah has packed her bags and is leaving. Des is very pleased(!) He tells Sarah that Daphne hasn't done anything, and she's worth a dozen of Sarah. SARAH: Well, you would think that, wouldn't you. Anyone can tell that you're madly in love with her! PAUL: You just can't stop lying, can you. He gets out the gun and puts it on the table. PAUL: That's the truth, isn't it. Lucy comes out and says she has to tell them something that can't wait. LUCY: Daphne had a gun hidden in the flour bin. Terry told me not to tell anyone. JIM: Well, er, thanks for telling us, sweetheart. Shane comes in and finds Danny and Max looking solemn. They tell him that Daphne has been taken away for questioning over the murder of Charles Durham. Shane is aghast and heads off to the police station. Terry is sobbing, yet defiant. TERRY: Well what do you want me to say, "I'm sorry"?! Well I'm not. PAUL: You said it was over! TERRY: He tried to kill me, Paul! PAUL: You said that was Daphne. TERRY: She was wearing my coat. PAUL: Tell me something. Did you kill him to save our marriage, or just your own skin. Paul stares at her, then goes to the telephone. PAUL: Calling the police. Will you tell them? HELEN: Why would Daphne have a gun in the house? JIM: Well, I wonder how much Terry knows about all this. She obviously knows Charles Durham. And he's beginning to sound like the sort of man that could have made that phone call on the day of the wedding. HELEN: What are you talking about? Jim fills her in about the bomb scare on the day of the wedding, and she's stunned. JIM: Too many things don't add up. I'm going to see if I can get some straight answers. PAUL: This is your last chance, Terry. PAUL: Everything between us is over. He starts to dial the number. 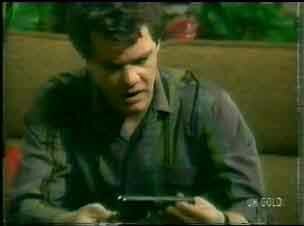 Terry picks up the gun which is lying on the coffee table. TERRY:(holding the gun) Paul, put it down, please! Please, Paul, I love you! Outside, Jim hears a gunshot. He rushes in and finds Paul on the floor. The back-door slams and Terry is gone.